Tableflip was the brainchild of Paul Peterson. He loved the internet expression, and wanted a way to express it in a playful way. I was contracted to do the illustration, and dieline work after Paul talked to Max Temkin, who decided to make this little idea a reality. A vine about the creation of Tableflip can be found here. And there are two other vines, found here and here. You can purchase it here. Paul's prototype (top left,) was a fun little bit of inspiration, but Max and I wanted something more substantial. 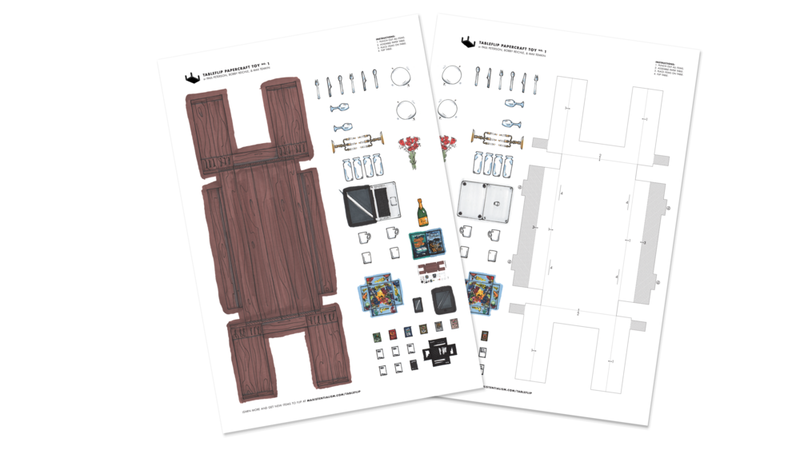 We wanted something like a fancy dining table you could flip, but we wanted to maintain the flatpack, paper doll idea that Paul had. So I prototyped several versions. 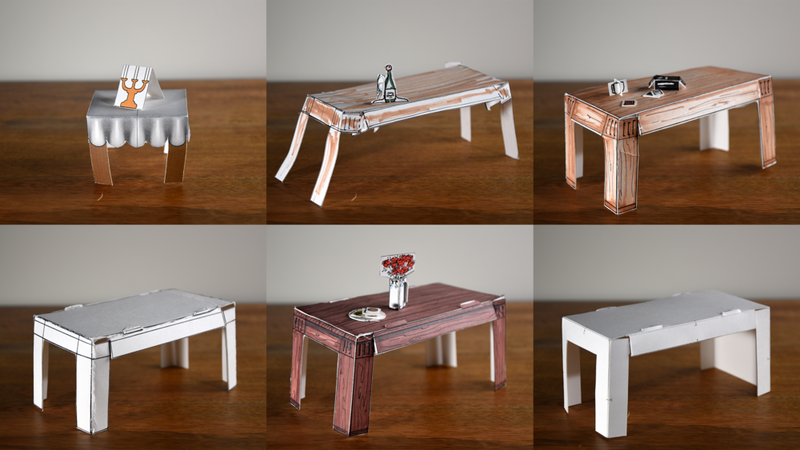 I remembered folding cardboard pizza boxes at my high school job at AMC, and remembered the insert tabs, and that was the main idea that allowed this table to take on the dimensionality and heft that it required to sell the Tableflip idea. We sourced all of the labor locally, and, in doing so, provided Reliable Die with the most complicated die template they've ever processed. A point of pride for me. The individual pieces on the sheet were inspired by a variety of sources. The candelabra came from Paul's original idea, and because he made the board game SmashUp, that was also included. Cards Against Humanity was also included, as Max Temkin was one of the co-creators. The Name of the Wind was also included, as this project was originally intended to be a goodie in Patrick Rothfuss's Worldbuilders charity. There was also a tiny Tableflip. We were lucky enough to be included in Unfolded - Chicago Design Museum's longest-running exhibit. I project managed the creation of a life-size replica of Tableflip, which was constructed by Andrew Bates, formerly of GravityTank. I was lucky enough to be able to flip the life-size table when tearing down the exhibit. Additionally, the die I designed, which was fabricated by Reliable Die, is now on permanent loan to the Chicago Design Museum. Here are two videos of people flipping the life-size table.